No, it's not Alexis Sanchez who's hogging the limelight at the Emirates. With eight goals from the club's last nine EPL matches the 28-year French striker Olivier Giroud is Arsenal's "go-to" man now. His brace against Newcastle on Saturday put the Gunners firmly in the hunt for the Premier League title race. They are just a point behind second-placed Manchester City's 61. Giroud's goal hunt began when he scored the third in a 3-0 win against powerful Man City in a FA Community Shield clash in August 2014. Arsenal won the shield and Giroud was made Man Of The Match despite featuring in the game as a half-time substitute. After scoring the equalizer in 2-2 draw with Everton, he was unfortunately ruled out for four months thanks to an injury to his left tibia. His 28th birthday on 30th September saw him enter into a new contract with Arsenal that fetched him a salary of £80,000 a week. Giroud returned from his injury earlier than expected and featured for the last 13 minutes in 1-2 loss against Manchester United, but scored his team's lone goal during the brief time he spent on the pitch. His double-strike helped the Gunners register a 4-1 home victory against Newcastle in December 2014. February 2015 saw him score twice in a three-minute blitz against Middlesbrough that helped the Gunners reach the quarter-finals of the FA Cup. February 25 was a dark day for the striker as he was substituted after 60 minutes of play against Monaco after missing several opportunities to score. The upshot was one of the most humiliating losses for Arsenal at the Emirates. 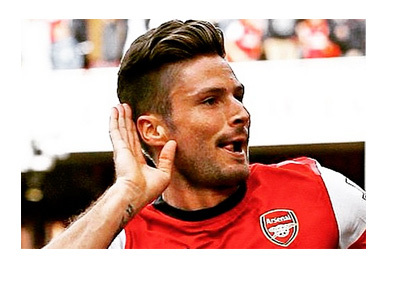 But Olivier Giroud was not one to look back and repent on such failings. He scored the opener in a 2-0 EPL win against Everton. He was exceptional in Arsenal's return match against Monaco at Monte Carlo, but a three-goal deficit was too much for the Gunners to make up. But Giroud as usual was the team's stand-out man with the opener and numerous shots on the goal. With him around the impossible looked possible. The French striker admitted that he was disappointed that Arsenal had to exit the UEFA Champions League, but said his team had much to look for in the Premier League. He said that his team needed to win all the eight remaining games and also hope for City or Chelsea to slip up somewhere during the coming weeks. Amazingly Arsenal are one team that hardly settle for draws. In the 17 matches they have played in 2015 in all competitions, they have lost thrice and won 14. After Saturday's win over Newcastle Gunners coach Arsene Wenger dubbed Giroud a "world-class" player and told the fans that they need to love and cherish him more from now on.